The sad part is that many students have no idea what they’re getting themselves into. They’re told that they’ll be able handle the monthly payment after they graduate and get that high paying job. Then that high paying job never comes, which makes paying off the loans feel like an impossible feat. For those of you who are in that type of situation, feeling smothered by your student debt, Student Loan Hero can help you sort out the mess. Student Loan Hero is a free program that walks students through the difficult job of tracking loans. With Student Loan Hero you can track ALL of your student loans in one place. You’ll also get access to strategies that can help you pay less interest, an in depth student loan summary and financial analysis, and advice on repayment programs. 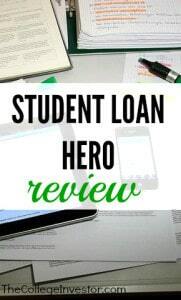 Student Loan Hero also comes with valuable tools like student loan calculators that can help you compare different loans, see if it’s smarter to refinance, and my personal favorite – see if it’s smarter to prepay your loans or invest your money. When you sign up for an account you’ll first link all of your student loan information and then create your profile. You’ll input personal information like your income, residence, cost of living, and more. Student Loan Hero can then give you customized advice based on your answers. They’ll be able to search their databases and see if there are any repayment programs or refinancing options that will save you money. You’ll get an awesome customized PDF showing your best options for not only paying back your loans but also for getting better rates. In addition to showing banks to refinance through Student Loan Hero also provides special programs you might qualify for. For example, there’s the National Health Services Corps Student Loan Program that offers special loan payment terms for those providing healthcare services to a high needs population. Another awesome program is the Illinois Veterans Home Nurse Student Loan Repayment Program which could qualify you for student loan forgiveness if you’re caring for Veterans. There are many more programs like these and Student Loan Hero will help find the one that’s right for you! Student Loan Hero also has seven different calculators (currently) that can help you figure you the best option for your student loan debt. I found two of these calculators to be very useful. First, they have a Student Loan Comparison Calculator that lets you compare the multiple options when it comes to various student loan repayment plans. You can see the interest accrued, expected monthly payment, and the total amounts you’ll pay under different plans. Second, they have a very good Student Loan Refinancing and Consolidation calculator. A lot of borrowers get into trouble with student loan consolidation, and this calculator really helps you understand the difference that you could potentially save by doing it right. Student Loan Hero wants to help YOU save money on your student loans. They’ll not only give you customized advice for your specific situation but they also stay up to date on the best banks to refinance through and student loan forgiveness. And since Student Loan Hero is able to earn their money by partnering with affiliates they can offer all of this to you for no charge. If you’re having trouble dealing with your student debt, Student Loan Hero might be just what you need. It’s free, so why not give it a try today: Student Loan Hero. I find Student Loan Hero’s site to be very beneficial. I learn things about my student loans that I did not know about.